Double-track Rotary Sushi Conveyor Belt is a new type of automatic vegetable feeding equipment developed by our company. Rotary Sushi Conveyor Belt length can be customized according to the size of the customers' site. 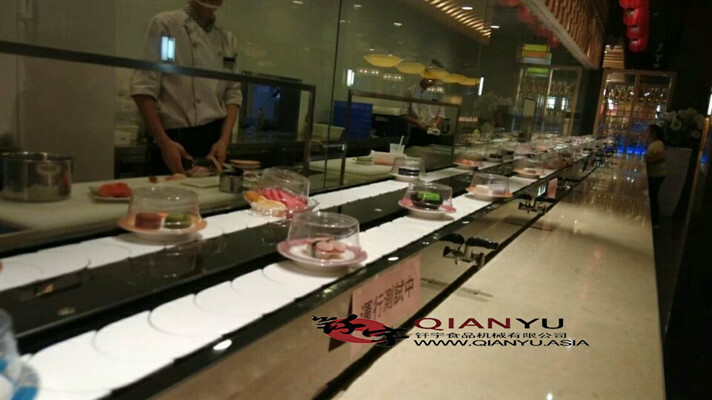 High Stablity Sushi Conveyor Belt chain plate is made of black steel , which is beautiful, clean, hygienic, conveying direction and speed can be adjusted freely. Is a variety of rotating Sushi Equipment, sushi rotating new fashion equipment. Sushi delivery equipment, is your new choice of fashion food! Looking for ideal Prices Rotary Conveyor Belt Manufacturer & supplier ? We have a wide selection at great prices to help you get creative. All the Factory Direct Sushi Conveyor Belt are quality guaranteed. We are China Origin Factory of Sushi Flat Turn Belt Conveyor System. If you have any question, please feel free to contact us.